What a treat we have in store! The creative genius that is Steve Rowe is coming to Cardiff in September to give a lecture to our members and visiting magicians. 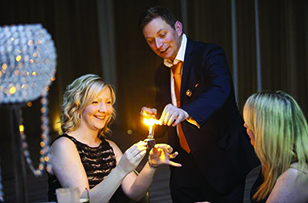 Steve is a highly experienced and successful working performer in his own right, but also has the most devious ability to create the extraordinary from the ordinary in his ‘pick n mix’ of products for other discerning magicians. We look forward to welcoming Steve to Cardiff Magical Society on the 11th of September, and hope you – if you are a magician of course – might join us. You can find the entry in our calendar for this event here. Entry for non-members is £10 on the door and we ask that you let us know in advance of your attendance.